in a Washington, D.C., suburb, the local branch of the Veterans Curation Program was having an open house. 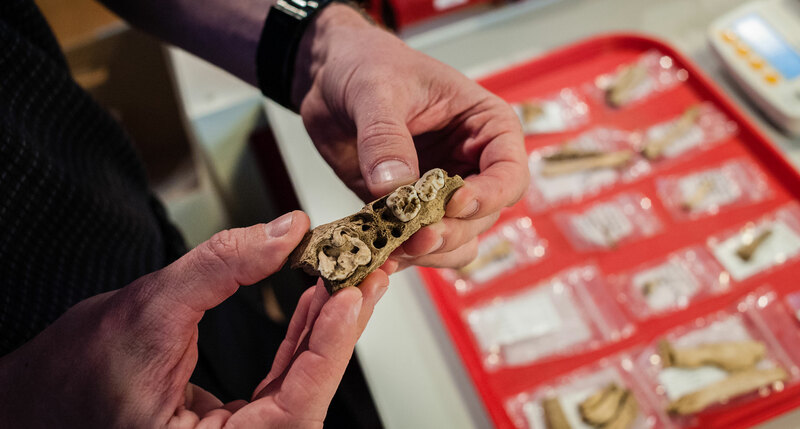 The VCP trains ex-soldiers to work in an archaeology lab, and on this day, a dozen recent veterans stood behind their neat desks, describing their work to a steady stream of visitors. One veteran operated a 3-D digital camera. Another stood, his back military-straight, over a display of catalogued artifacts. 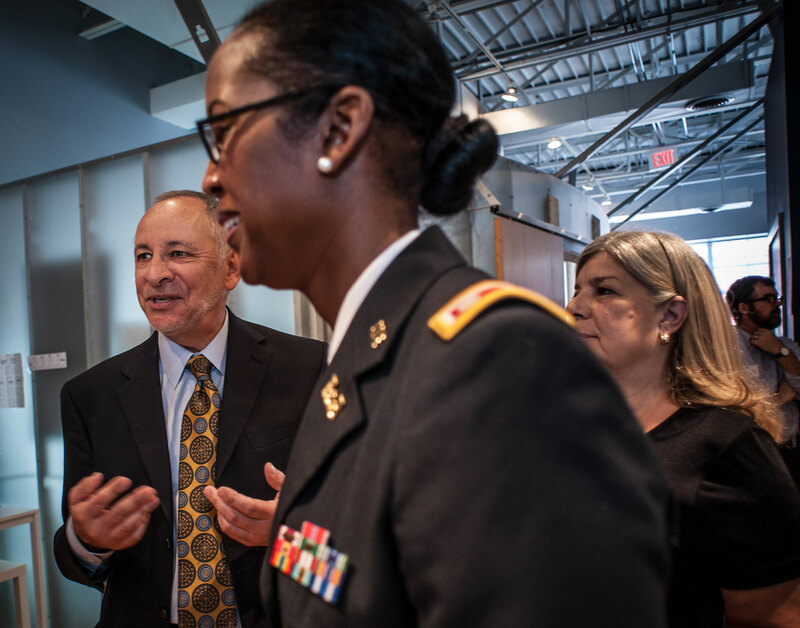 In one corner of the vast, open office, an assistant secretary of the Army was extolling the program’s virtues: It has a remarkable 87 percent success rate in transitioning veterans to civilian jobs or higher education. Across the room stood the program’s founder, Michael “Sonny” Trimble (’74). Trimble wore a suit and tie, but he had the suntan and active stride of a man who works outdoors. He was talking about windows. Trimble gives visitors a tour of the Veterans Curation Program offices in Alexandria, Virginia. After he got back, Trimble thought a lot about the soldiers who had kept him alive in Iraq. He wondered what would happen to the ones who didn’t become cops or firemen, what kind of jobs they might do. The Corps of Engineers had millions of artifacts to archive. The military had thousands of veterans needing jobs. Trimble figured he could train some of the veterans to work in his archive, and along the way, teach them the basics of office work in the civilian world. Recently separated veterans work to catalogue some of the millions of artifacts curated by the U.S. Army Corps of Engineers. Now Trimble scanned the row of desks. As they often do, his eyes shrewdly took the measure of the scene before him. A few months ago, most of the veterans at these desks had been at the low points of their careers. Now they stood in front of a bank of exposed windows, explaining their highly technical work with ease. In the summer of 2004 Sonny Trimble flew over the Tigris and the Euphrates in a Black Hawk helicopter. Like any archaeologist, he felt a rush of excitement as he glanced down on the cradle of civilization. But the chopper pressed on. Trimble and his team were headed deep into the Ninawa desert, where in the late 1980s Saddam Hussein’s forces had executed — and buried — at least 50,000 Kurdish civilians in mass graves. 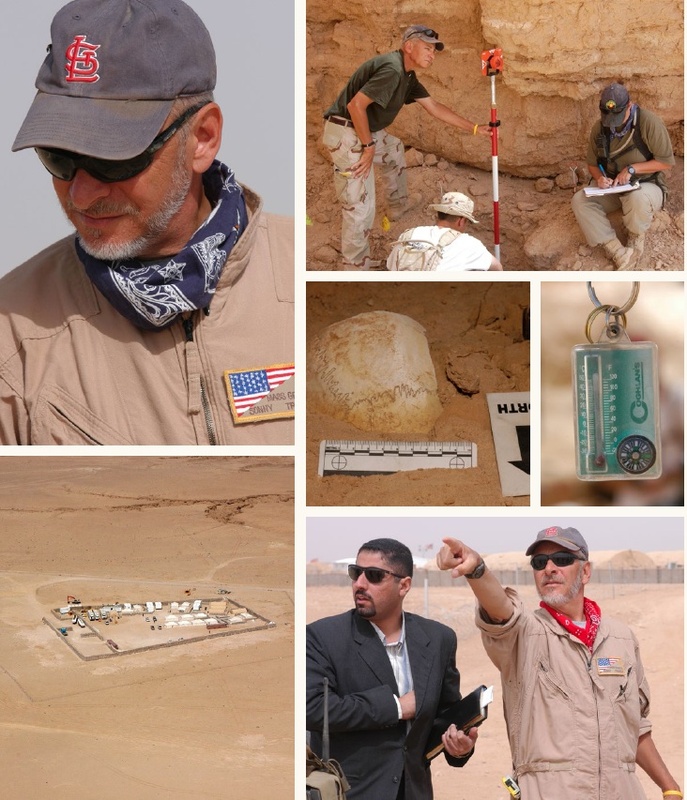 Trimble’s team was assigned to excavate a representative fraction of those graves, with the goal of collecting enough evidence to convict Saddam Hussein of crimes against humanity in the new Iraqi courts. The heat was overwhelming: 115 degrees. You felt as if your brain were boiling in your skull. Then there was the isolation. The desert seemed to stretch to the horizon in every direction, so that the cordoned-off rectangle of sand with its bulldozing equipment, the little American encampment with its white, igloo-like tents, stood out like a target. Fresh out of the Ph.D. program at the University of Missouri, he had audaciously proposed to the Army Corps of Engineers that it create a curatorial center of expertise to manage all its artifacts lying in storage; in 1991, the Corps obliged, and installed Trimble as its director. He soon developed a reputation as a maverick. He was ambitious, and he wasn’t afraid to take on jobs that he’d never done before. 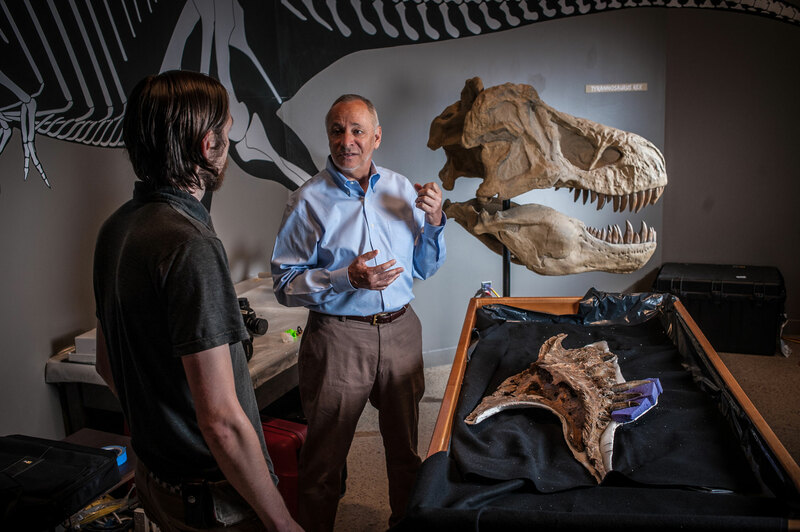 Time and again, Trimble made his way to the center of big, national projects: Kennewick Man, the African Burial Ground National Monument in Lower Manhattan, the loan of a rare T-Rex to the Smithsonian. 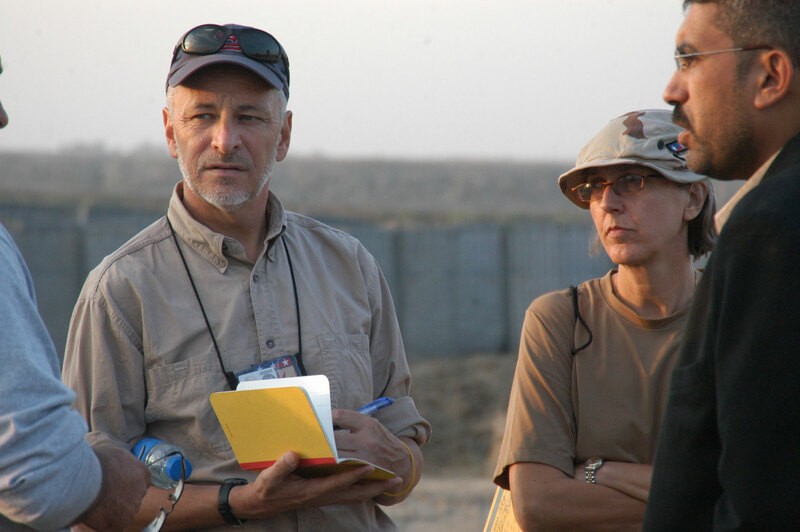 Trimble, who hailed from a family of Marines and had always wanted to serve his country, saw Iraq as a “once-in-a-generation” mission that would require all his strengths: assembling a team, motivating people in the field, managing logistics, designing and building systems on the ground. He was experienced in working at grave sites; given the choice in his career, he had always opted to work on skeletons over pottery. Even when the mission had been a weighty one, like helping the Joint POW/MIA Accounting Command to recover the remains of American soldiers in Southeast Asia, he had never hesitated to volunteer. Despite the urgency, Trimble and his team spent most of their first week staring at sand. While U.S. soldiers secured the perimeter of the rectangular pit, a track hoe operator skimmed off sand. Trimble directed him, a few centimeters at a time. All eyes watched for a slight change in sand color: the telltale sign of corpses beneath. Trimble told the operator to make parallel passes with the track hoe to see how wide the grave might be. He knew that in a massacre, the victims would fall at angles. At the first sign of a foot or a head, Trimble called over the team members. Carefully they cleared away the last layer of sand. The dead lay tangled in stacks: women, children and babies in brilliant-colored traditional Kurdish clothes, most of them with gunshot wounds to the head. The babies’ thin skulls had shattered into tiny pieces. "That was a shock for me. To see bones inside of clothes." Trimble’s team pulled 123 people from the first grave site. All were women and children. The average age was 11 years old. The majority had been shot in the back of the head. The team mapped, sketched and photographed the dead exactly as they were found, taking pains to gather every scrap of evidence. Then, as much out of compassion as duty, the team made a case file for each victim, to honor each life. When the field analysis was completed, workers placed every victim’s remains into a body bag. As soldiers loaded the body bags into trucks, Trimble stood nearby, watching. “Treat these people well,” he said. Along one of Washington’s power corridors, Sonny Trimble was hoofing it to a meeting with a VIP. He still wore the suit and tie, but now he carried a duffel bag — that telltale sign of his life in the field — which he needed to stash somewhere before his meeting. His cellphone rang: the theme song to “The Good, the Bad and the Ugly.” With a sheepish grin, he switched it off. Though Trimble has been based in St. Louis for 27 years, he gets the rhythms of Washington: the hiring cycles, the funding cycles, the fact that when you get five minutes with the top brass, you have to make it count. This savvy stems in part from being raised in a nearby suburb by Washington insiders. His father, a medical officer in the Public Health Service, designed and built health centers around the world in the 1950s and ’60s; his mother, a voracious reader, was a senior codebreaker at Arlington Hall during World War II. After the war, Mrs. Trimble became a full-time mother, but “she let it be known that she was not going to sit in Virginia and be a housewife.” Mrs. Trimble told her husband to find a posting. If she was going to do something ordinary, she wanted to do it in an extraordinary way. So the family moved to Ethiopia. Sonny grew up there in the 1950s, between the ages of 5 and 13, playing with the local kids, because his parents preferred not to be cooped up in the embassy compound. They lived in a series of old Italian villas on the edge of town, because his parents believed “we could only experience Ethiopia and the Ethiopians by living out amongst them.” Sonny learned about America from the Sears Roebuck and Co. catalog and U.S. News & World Report, and annual trips to visit his grandparents in Virginia. Wake Forest was affecting Trimble in other ways, too. He began to think more about “doing good things — not just things that are for you. I had not thought about that before.” He was also working harder academically than he had ever worked in his life. When Woodall led a study-abroad trip to Venice, Trimble, who was not a straight-A student, didn’t expect to be chosen. When Woodall called and told him to pack his bags, he “almost started crying,” he was so moved by Woodall’s faith in him. The Venice semester marked Trimble’s first time traveling as a young adult. It started off with a bang. Woodall, who was traveling with his wife and baby, invited Trimble and another student to come along to Yugoslavia in a Volkswagen bus with a broken taillight. Several hours later, Trimble was in the passenger seat when border guards with AK-47s approached the van, shouting at them to stop. He found himself sitting at the border station while Tito’s officials thumbed through his passport and the baby wailed. "If a piece of history can be salvaged, it ought to be." At a storage facility, Trimble unlocked a giant wooden gate and yanked hard. The door swung open, revealing an overgrown yard. His eyes bluntly took the measure of the scene before him: a hundred enormous carved stones on pallets, their white paint flaking in the sun. Few except Trimble would have known what they were: the disassembled pieces of the columns of the 1818 United States War Department building. “These are really beautiful pieces of American history,” he said. Trimble at Arlington National Cemetery with the disassembled pieces of the former Ord-Weitzel and Sheridan gates. The restoration is scheduled to be completed in 2017. After the Civil War the columns had traveled from the old War Department to Arlington Cemetery, where they became the Ord-Weitzel and Sheridan gates to the cemetery in 1879. In 1971 they were pulled down to widen the road and abandoned in a grove of trees. They were still languishing there two years ago when Trimble got the call to come and restore them. I asked him why he was doing it. He looked surprised. 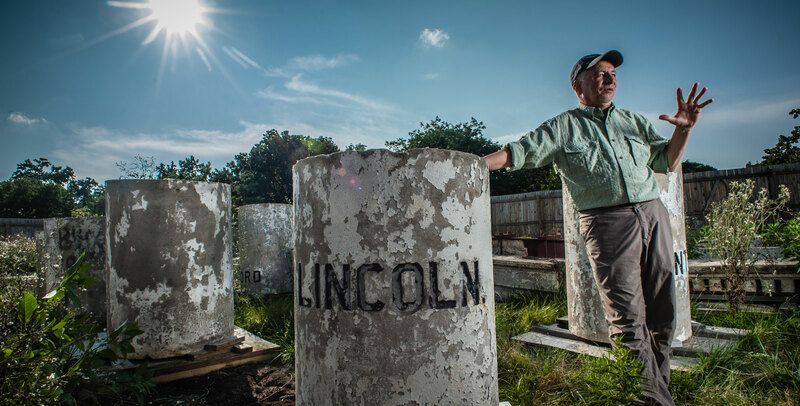 “If a piece of history can be salvaged, it ought to be,” he said. On the next dig, he made up his mind to do it differently. “I told the guys in Baghdad, ‘I want to live on site, 200 meters from the bodies.’ ” Baghdad obliged, guarding the new dig and its encampment with 60 full-time private security guards. Trimble had yearned for a job that would use every skill he had, and here it was: “functional analysis” at its most intense. As is his wont, Trimble hired people he could lead but wouldn’t have to micromanage, and created systems to help them do their best work. To minimize the number of people he exposed to danger, he gradually replaced some of the experts with people he could train to do multiple tasks; the team shrunk from 30 to 19. Because working in a field lab 200 miles from Baghdad was both less safe and less efficient, Trimble persuaded his bosses to build a state-of-the-art forensics lab in Baghdad. A senior official agreed to let him use two Black Hawk helicopters (“the taxicabs of the war”) to ferry body bags back to the lab in Baghdad. In all, the team would excavate 301 Kurds and Shiites from three crucial grave sites, and photograph dozens of other mass graves to hint at the scope of the massacres. Trimble’s final report, a masterpiece of its kind, showed evidence that Saddam had committed crimes against humanity in crystal-clear, incontrovertible detail. If you have a chance to raise the bar, you should. Among the graves of servicemen and women at Arlington National Cemetery. “I feel in debt to those guys forever,” Trimble said. So it was that Trimble, his “heart beating really fast,” found himself on the witness stand in a courtroom of the new Iraqi government in April 2008, facing Saddam Hussein himself. Trimble gave five and a half hours of testimony. All over the Middle East, shops closed, and people watched Trimble’s testimony as it was broadcast live. Carefully, methodically, he described the massacres: how the killers herded their victims into the pits, the firing methods, the weapons. He described how ballistic evidence showed that killers shot some of the victims in the legs first, so that they couldn’t run. He talked about how the killers chose remote desert sites, hidden by hills, so that locals wouldn’t see them. Saddam Hussein, representing himself, rose to cross-examine the witness. He began by attacking Trimble’s credibility, arguing that an expert “from the army of the enemy” couldn’t be trusted to tell the truth. The Iraqi court disagreed. Due in large part to the evidence collected and presented by Trimble’s team, Saddam Hussein was convicted of crimes against humanity. Trimble had one more stop to make in Washington. He was at the Smithsonian (“I used to dream about working here”) to check in with the paleontologists who were preparing a Corps-owned Tyrannosaurus Rex for exhibition. Walking into a room filled with crates and scientists, he was immediately at home. He made a beeline for the bones. 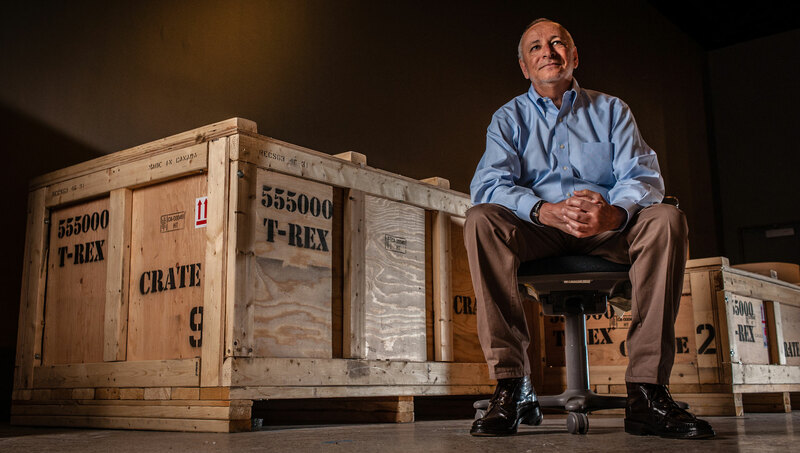 Trimble with special crates designed to protect the bones of a rare Army Corps of Engineers-owned T-Rex: The Smthsonian’s highly anticipated exhibit opening in 2019. Anthropology is the study of human beings. Sonny Trimble is a civilian who works well with the military; an academic who is at home among track hoes and cranes. He studies the dead, but he also develops the potential of the living. He thinks if you can raise the bar, you should. And he is a big believer that if a guy wants to learn something, he’d better do it himself. Joy Goodwin (’95), a journalist and screenwriter, is currently adapting a collection of true stories from the Underground Railroad for television. She teaches creative writing at The University of North Carolina at Chapel Hill.